Hey, guys. I am... exhausted. It's the end of the summer and summer is the uber-crazy busy season here on Cape Cod so I'm just beat up from the last few months. I'm coming home and falling asleep on the couch while reading a book before it's my six year old daughter's bed time. Like, literally I'm never more happy than when I'm reading about astrophysics and evolution and I can't even stay awake for it. How can you fall asleep to Richard freakin Dawkins? He's captivating. But this has been a normal occurrence for me at end of the summer for the last few years. I get run down and I'm not myself. I'm closer to 40 than 30 now. Things hurt. Gas runs out. As the great Bernie Mac said: "I'm tired, America. My body weary." So I apologize but the next few reviews will probably be pretty short and blunt. But, on the bright side, there's a good chance you'll be spared from my usual shenanigans. Colomé is in Salta, Agentina where the altitude of the vineyards make them the highest in the world. The winery has been around since 1831 and today it's under ownership of the Hess Family Wine Estates. All of their wines are fully sustainable. I'll get more informative on the winery in my review of Colomé Estate Malbec 2013 (September 8th). 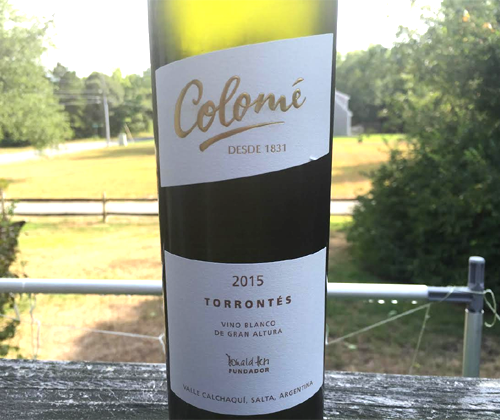 Torrontés is a white grape unique to Argentina and it can be traced back to the 1800's. Analysis of its DNA discovered that it's a cross between the Mission grapes that were so popular with missionaries (thus its name) and Muscat of Alexandria. In recent years Torrontés has been fully embraced by the Argentinian wine industry as its signature white wine. This is 100% Torrontés and the grapes are from thirty to sixty year old vines in Calchaqui Valley within Salta. It's slowly fermented at low temperatures in stainless steel, sees no oak aging but three months bottle aging, and the final ABV is 13.5%. The color of the wine is a very light and pale yellow with almost a silverishness to it. There's aromas of Tic-Tacs, oranges, roses and cumin. In the mouth it has a little drop of sweetness, bright but not powerful acidity, medium body, and a WD-40 mouthfeel. Not that I've ever had WD-40 in my mouth. I, uh, know from a friend. For flavor there's melon, a squeeze of lime and a squirt of orange. This is a nice, satisfying Torrontés for $15 and it's definitely a hot weather warrior. So with summer closing out in the northern hemisphere, get it while it's still nice out.